UMATILLA - In a Thursday night December 11 game at the Columbia River Classic Umatilla hosted Helix in girls basketball action. Umatilla won in overtime 54-46. Helix came out strong to take a 12-6 lead at the end of the first period. The Vikings played a little tentatively during the first few minutes. The Vikings had opportunities to score but turned the ball over quite a bit. Helix continued to outscore the Vikings in the second quarter. Umatilla did start to connect on their passes and picking away at the Helix defense. Helix lead at halftime 22-15. Umatilla played the third quarter like they were a different team. They outscored Helix 15-8. The Vikings found their range hitting shots that had been bouncing off the rim in the first half. As the period progressed the Viking became more confident in their ability to score. At the end of the third the teams were tied 30-30. Umatilla was leading 39-34 with 4:17 to go in the game when Helix put on a seven point run to tie the game 41-41 at the end of regulation. Umatilla scored the first points in overtime to take a 43-41 lead. Helix came back with a three pointer to take a 44-43 lead. Umatilla then went on a nine point run before Helix scored again with 23 second to go in overtime. The Vikings had the momentum in overtime and took the 54-46 win. Nice play by Naomi Castanon, Ashley Vandever, Kassie Kennedy, Catherine Routson, and Jessica Vandever through the game and down the stretch in overtime. LEFT - Kassie Kennedy of Umatilla passes the ball. RIGHT - Katelynn Cranston of Umatilla looks for an opening. 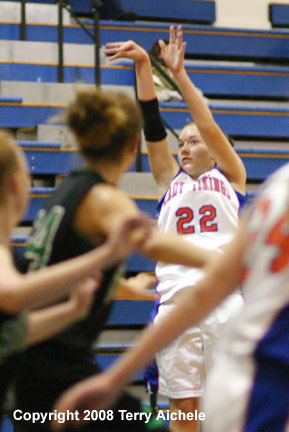 LEFT - Jessica Vandever of Umatilla takes a shot. RIGHT - One of the Viking cheerleaders is lifted high to fire up the crowd. 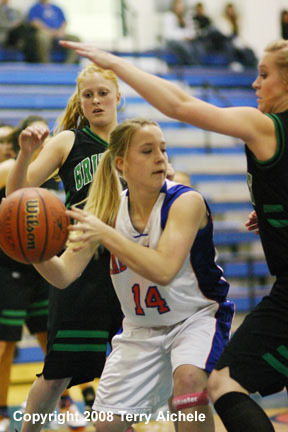 LEFT - Viking Kassie Kennedy drives to the basket. 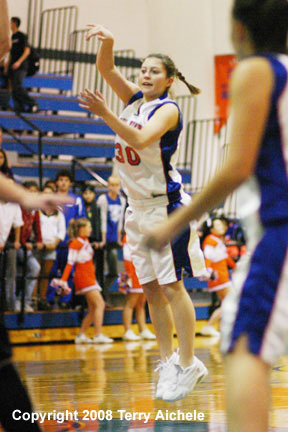 RIGHT - Katelynn Cranston of Umatilla looks for someone to pass to. 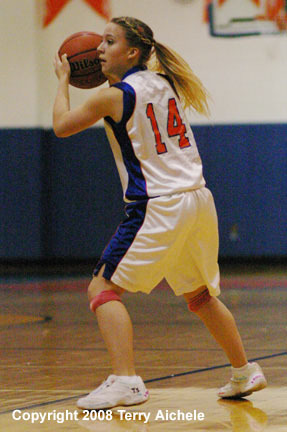 LEFT - Catherine Routson of Umatilla brings the ball up the court. 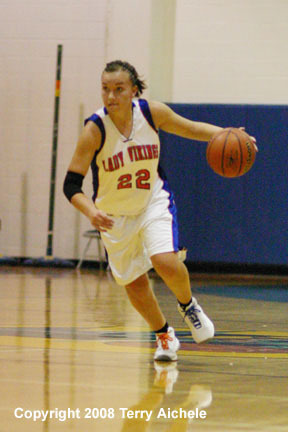 RIGHT - Viking Catherine Routson sees an opening and drives to the basket. 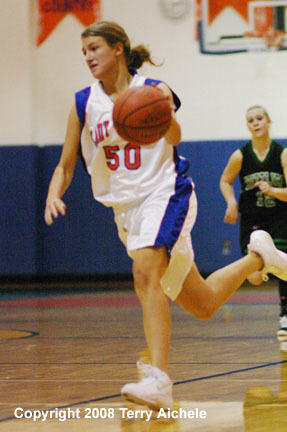 LEFT - Jessica Vandever of Umatilla bringing the ball into the forecourt. RIGHT - One of the Umatilla cheerleaders fires up the crowd late in the game. 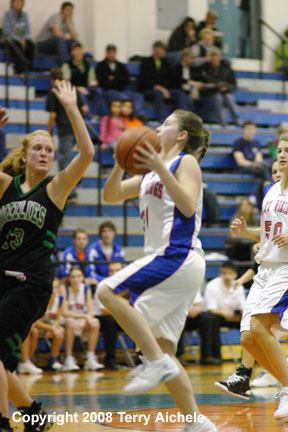 LEFT - Kassie Kennedy of Umatilla rolls to her left on a drive to the basket. 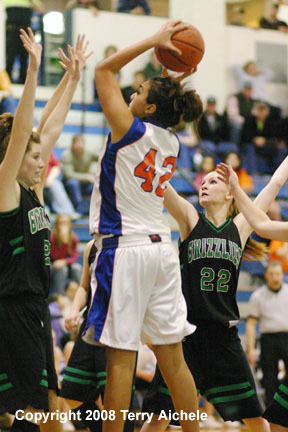 RIGHT - Naomi Castanon of Umatilla goes up for a shot against a Helix defender.